Bring a touch of elegance to your yard with the Perky-Pet® Antique Bottle Hummingbird Feeder. 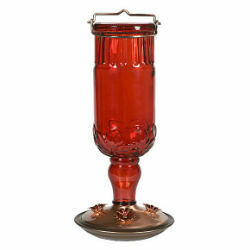 You will love the vintage accents and the hummingbirds will love feeding from the four decorative metal feeding ports. This large capacity feeder holds 24 ounces of nectar to ensure that there will be plenty to go around! The feeder is sure to attract the hungry hummingbird’s attention.